To Infinity & Beyond! 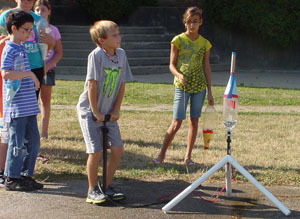 Students construct rockets and send them skyward! Adrian Schools Educational Foundation exists to give students learning experiences that will last a lifetime! Our mission is to support the educational excellence of Adrian Public Schools. Our donors partner with us so that we may award materials and equipment for student use through our classroom grant program. The Foundation now has a General Academic Endowment which provides interest for general classroom grants. Through its Fine Arts Endowment, the Foundation also gives students the opportunity to participate in the visual, performing, vocal and instrumental arts during their K-12 careers. The Adrian Schools Educational Foundation supports the district's vision of helping each student reach his or her potential across all areas of study. It partners in the STEM Program (Science Technology, Engineering and Math), the Fine Arts, and awarded $89,000 in classroom grants for the 2018-19 school year.